These conversations happened at least once a night. They were usually followed with shock that I had turned out to be in the industry. I didn’t really understand what was so shocking. I grew up very sheltered. Or, my parents did their best to shelter me. Religion was constantly shoved down my throat. There was nothing gentle about. My life revolved on the outside of legalistic religion. We went to church three times on Sunday, once on Wednesday, had chapel at school on Monday, Bible class Tuesday through Friday, and would listen to my dad read the Bible to us for about a half hour every night before prayer. There was not much breathing room. My mental getaways consisted of turning into a gym addict starting at age 14, where I could listen to scandalous non-christian music, and get rid of all my stress and tension. I am thankful for those nightly gym sessions. 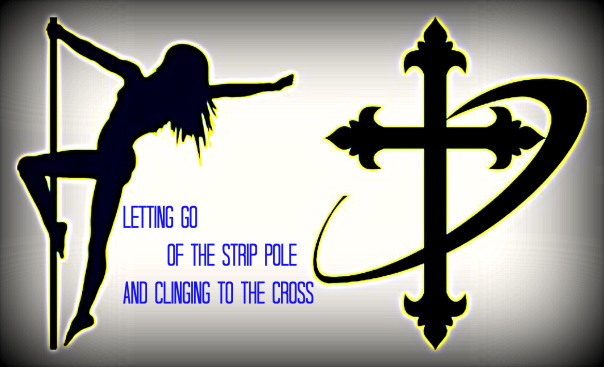 So how does one go from straight religion to working the pole on a Friday night? I began a relationship with Jesus at the age of 14. I had a very tough time throughout my adolescent years, interacting with my parents was DREADFUL (I now have a very good relationship with my mother.) Without God as my rock, I do not know how I would have made it through those years. So does that mean that I was a christian stripper?? Yes, yes it does. If my shorts were too short it was a sin. If my hair fell over my eyes, that was a sin. When I was busted for having ‘Cosmo-Teen’ magazines, that was VERY sinful. If I wore my jeans too tight, that was a sin. If my sister or I played with our necklace, hair, or were distracted during our family devotions, we were told we were going to burn in hell for it. I vividly remember my father yelling at my sister “Get behind me Satan!” when she did something he did not like. We were condemned and judged with every movement. We learned how to do everything on the down low. When my sister got her drivers licence we would buy cute clothes, hide them, and change in the car on the way to wherever we were going. Lying was survival for us. We became extremely good liars, we used to joke that we would be able to murder someone and lie our way out of it we had become so good at it. I was used to be mentally and verbally torn to pieces by my parents. I knew that some things were right, and some things were wrong, but I was not sure what went where, my parents taught me everything was wrong, that couldn’t be the case, so I would have to find out on my own. I was 18 when I first worked at the club. I was living at home. I would say I was spending the night at a friends, and I would work at the club for the night, we usually got out around 7:30am. I was not a regular entertainer at that time, I would work a few nights a month. The other weekends I would spend at a normal dance club, get drunk before going, enjoy free drinks all night, and dance the night away. I would make out with some guys, and go to after parties, but I was still a virgin. I was happiest when I was drunk dancing on top of a bar or a stage. I loved to dance. The summer after I graduated High School I had a difficult conversation with my father, and told him I was moving out. I had been looking forward to moving out of my parents home for as long as I could remember. He was a proud man. He told me if I moved out he would not walk me down the isle when I got married (I didn’t even have a boyfriend.) I was not phased, that was such typical behavior for him. I found a little studio in a ghetto area. Two weeks before I was to move in, my father kicked me out of the house – of course. From that point, I found myself trying to decide what was right and what was wrong. I knew I loved Jesus, and I at least knew the ten commandments, and a lot of Bible verses, but I had to find out what was right and wrong in God’s eyes, not my parents, not my schools. I felt no guilt when I was dancing, fooling around with guys, or drinking excessively. Because I felt no guilt, and I couldn’t find scripture speaking specifically on it, I decided there must not be anything wrong with it. I had many conversations with customers at the club about the Bible, about God, while I was giving them a lap dance or dancing for them naked. Other dancers would have questions about God and I would answer them, and try to sneak in a little gospel with that. When customers would ask me “doesn’t the Bible say it is wrong to strip?” I would ask them where it said that. I was not rebellious at all. I did not try to displease my parents at all, in fact they still don’t know this story. I was just so utterly confused about right from wrong by being taught that what felt like everything was wrong, that I had to start all over with learning right from wrong. How could I not feel guilt??? I guess that I had so much guilt poured on me daily for things that were not worthy of guilt maybe it desensitized me of guilt. Or, maybe it was the dark side blinding me. Either way, I did not think it was wrong to be dancing naked for money. I actually quite enjoyed it. Not only was I taught that I was wrong in almost everything I did, I was also not allowed much freedom. As an 18 year old my curfew was 10pm, if I got home at 10:03 I was grounded. I was not allowed simple things like watching a movie that was PG13 at a christian friends house if there were boys that would be there. If I wanted to go to a PG movie with two of my girlfriends or shopping at the mall, that was not allowed. The more rules and regulations a person has on them, the more they will break. The tighter you hold the leash, the harder it will be pulled. The smaller the cage, the further the free will run. Going from 3%-100% freedom, there is a good chance that many poor (and fun) choices will be made. And that’s what it was all about. Fun.